The Dominican Republic, (Spanish: República Dominicana, IPA [re'puβlika domini'kana]) is a country located on the eastern two-thirds of the Caribbean island of Hispaniola, bordering Haiti. Hispaniola is the second-largest of the Greater Antilles islands, and lies west of Puerto Rico and east of Cuba and Jamaica. A legacy of unsettled, mostly non-representative rule lasted for much of the 20th century; the move towards representative democracy has improved vastly since the death of military dictator Rafael Leónidas Trujillo in 1961. Dominicans sometimes refer to their country as Quisqueya, a name for Hispaniola used by indigenous Taíno people. The Dominican Republic is not to be confused with Dominica, another Caribbean country. The earliest inhabitants of the island of Hispaniola, on which the Dominican Republic is located, were the Taínos. The Taínos were a seafaring branch of the South American Arawaks. Taíno means "the good" or "noble" in that native language. A system of cacicazgos ( chiefdoms) existed. They were called Marien, Maguana, Higuey, Magua and Xaragua (also written as Jaragua) by the natives. These chiefdoms were then subdivided into subchiefdoms. The cacicazgos were based on a system of tribute, consisting of the food grown by the Taíno. Among the cultural signs that they left were cave paintings around the country, which have become touristic and nationalistic symbols of the Dominican Republic, and words from their language, including ‘hurricane’ (hurrakan) and ‘tobacco’ (tabakko). The northern dialect is more closely influenced by the Taíno language than the southern. Many Dominicans in the region (known as Cibao) pronounce their 'r' as 'i'. "Comer" (spanish for 'to eat'), is pronounced "comei," by the northerners. Christopher Columbus explored and claimed Hiapaniola for the Spanish crown during his first voyage to the hemisphere in 1492. On his return the following year, Columbus founded the first European settlement in America at La Isabela. Hispaniola was to become a springboard for Spanish conquest of the Caribbean and the American mainland. In 1697, Spain recognized French dominion over the western third of the island, which in 1804 became independent Haiti after a slave rebellion. The remainder of the island, by then known as Santo Domingo, sought to gain its own independence in 1821, but was conquered and ruled by the Haitians for 22 years; it finally attained independence as the Dominican Republic in 1844. In 1861, the Dominicans voluntarily returned to the Spanish Empire, but two years later a war of independence was launched, ending with victory in 1865. The United States ruled Dominican territory with a military government from 1916 to 1924. From 1931 to his assassination in 1961 dictator Rafael Leonidas Trujillo ruled the Dominican Republic. During this time, the nation experienced social and economic progress. Since 1965, however, the nation's people have experienced economic hardships. In 1965, US troops arrived in the Dominican Republic, as well as forces from Honduras, Brazil and Costa Rica. They remained in that country for over a year and left after supervising elections in which they ensured victory by Joaquín Balaguer. He retained power for the better part of 30 years and ruled his people in the grand Latin American style. The rich became richer and the poor had babies (hungry babies); democracy remained an alien concept. Balaguer was pressured out of office in 1996 following international outcry over fixed elections. Politics of the Dominican Republic takes place in a framework of a presidential representative democratic republic, whereby the President of the Dominican Republic is both head of state and head of government, and of a pluriform multi-party system. Executive power is exercised by the government. Legislative power is vested in both the government and the two chambers of the National Congress. The Judiciary is independent of the executive and the legislature. 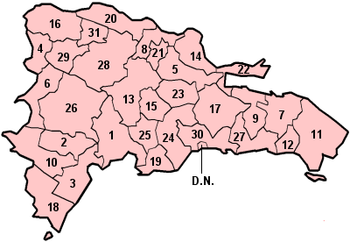 The Dominican Republic is divided into 31 provinces. The national capital, Santo Domingo, is contained within its own Distrito Nacional. Please note that the names of provincial capital cities are provided in parentheses where they differ from the name of their respective provinces. * The national capital, also known as Distrito Nacional (D.N. ), is the city of Santo Domingo de Guzmán. The capital of the country is the city of Santo Domingo (full name Santo Domingo de Guzman), located in the Southern part of the island. Originally a single city located within the province Distrito Nacional (National District), it has now been divided into a Province of Santo Domingo and the National District. 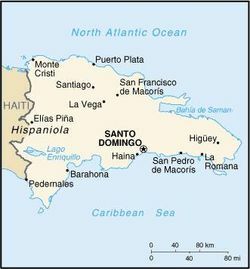 The Province of Santo Domingo is comprised of several municipalities: Santo Domingo Norte (North Santo Domingo), Santo Domingo Este (East Santo Domingo, which is the provincial capital), Santo Domingo Oeste (West Santo Domingo) and Boca Chica. The Ozama River serves a natural border between the National District and the Province of Santo Domingo. Thus the capital city of the Country is the City of Santo Domingo de Guzman, Province of National District. The second largest city is Santiago de los Caballeros, more commonly referred to as simply Santiago. The country has three major mountain ranges: The Central Mountains (Cordillera Central), which originate in Haiti and span the central part of the island, ending up in the south. This mountain range boasts the highest peak in the Antilles, Pico Duarte (3,087 m / 10,128 ft above sea level). The Septentrional Mountains, running parallel to the Central Mountains, separate the Cibao Valley and the Atlantic coastal plains. The highest point here is Pico Diego de Ocampo. The lowest and shortest of the three ranges is the Eastern Mountains, in the eastern part of the country. There are also the Sierra Bahoruco and the Sierra Neyba in the southwest. This is a country of many rivers, including the navigable Soco, Higuamo, Romana (also known as 'Rio Dulce'), Yaque del Norte, Yaque del Sur, Yuna, Yuma, and Bajabonico. Puerto Plata's Mount. Isabela is famous for the Cuban plane that crashed there in 1992. Navidad and Silver Banks have been officially claimed by the Dominican Republic. The country is a Tropical maritime nation, with a wet season from May to November, and periodic Hurricanes between June and November. Most rain falls in the Northern and Eastern regions. The average rainfall is 1346 mm, with extremes of 2500 mm in the North-east and 500 mm in the West. The mean annual temperature ranges from 21°C in the mountainous regions to 25°C on the plains and the coast. The average temperature in Santo Domingo in January is 23.9°C, and 27.2°C in July. The Dominican Republic is a middle-income developing country primarily dependent on agriculture, trade, and services, especially tourism. Although the service sector has recently overtaken agriculture as the leading employer of Dominicans (due principally to growth in tourism and Free Trade Zones), agriculture remains the most important sector in terms of domestic consumption and is in second place (behind mining) in terms of export earnings. Tourism accounts for more than $3 billion in annual earnings. Free Trade Zone earnings and tourism are the fastest-growing export sectors. Remittances (remesas) from Dominicans living abroad are estimated to be about $3 billion per year. Following economic turmoil in the late 1980s and 1990, during which the GDP fell by up to 5% and consumer price inflation reached an unprecedented 100%, the Dominican Republic entered a period of moderate growth and declining inflation until 2002 after which the economy entered a recession, after the second commercial bank of the country ( Baninter) collapsed, caused by a major fraud of 3.5 billion of dollars during the administration of President Hipolito Mejia (2000-2004). The Baninter fraud had a devastating effect on the Dominican economy, with GDP dropped by 1% in 2003 while inflation ballooned by over 27%. With the election of former president Leonel Fernández in 2004 and implementation of economic reforms, the economy has re-stabilized and strong GDP growth has resumed. The growth of the Dominican economy remains significantly hampered by an ongoing energy shortage, which causes frequent blackouts and high prices. According to the 2005 Annual Report of the United Nations Subcommittee on Human Development in the Dominican Republic, the country is ranked # 71 in the world for resource availability, # 94 for human development, and # 14 in the world for resource mismanagement. These statistics emphasize the national government corruption, the foreign economic interference in the country, and the rift between the rich and poor. The Dominican Peso (RD$) is the national currency of the country although the U.S. dollar is often acceptable in some places, especially tourist oriented shops and hotels. Initially, the peso was worth the same as a U.S. dollar. In more recent years, however, the value has decreased relative to the US dollar. The exchange rate to the U.S. dollar was about RD$14.00 in 1993 and RD$16.00 in 2000, but in early 2004 reached RD$54.00 per U.S. dollar. It ended the year 2005 at about RD$34.00 per dollar. The exchange rate between the two currencies fluctuates on a daily basis, and is usually between $33.00-34.00 pesos as of September 2006. The International Monetary Fund revealed a growth of 7.6% over inflation index for 2006, which implies that the national currency of the Dominican Republic could naturally finish the year with an average basis between 35.70 and touching 38 per dollar roof. Another factor which would have a certain impact over the currency exchange market of the Dominican Republic is the fluctuations of the American Dollar at international currency market. The U.S. dollar is implicated over almost all commercial actions of the Dominican Republic, supporting the theory that explains the devaluation of the peso in front of the dollar in 2005 is the result of the international currency market; On Feb 2005 1.32 USD = one € = 29 DR pesos, later on Oct 2005 1.19 USD = one € = 32 DR pesos. Multiple local economists (Andres Dahuajre Jr. and Jaime Aristy Escuder, principally) and well-recognized commercial analyst firms and institutions estimated an over-evaluation of the Dominican Peso suggesting that the daily basis of the Dominican currency is artificially controlled by the government, considerably bordering a free market's policies. According to the CIA World Factbook, about 70% of all Dominicans are mixed, that is, of mixed European, African and indigenous American ancestry. Around 16% of Dominicans are Spanish descent and about 11% are black. A smaller presence of East Asians (primarily ethnic Chinese), Japanese and Middle Easterners (primarily Lebanese) can also be found. The culturally indigenous population is practically extinct. Since the early 1960s, economic problems have led to a vast migration of Dominicans to the United States, mainly to large east coast cities. New York City's Washington Heights is so densely populated by Dominicans that it is sometimes referred to as Quisqueya Heights. Quisqueya is a popular name for Hispaniola that derives from the island's original Arawak name. Sizeable Dominican emigre communities exist in Spain. 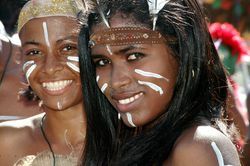 The Dominican Republic is a Hispanic country, therefore, as with all Hispanic countries in the Americas, its culture and people is derived predominantly from Spain, though heavily blended with African traditions and indigenous American cultural elements. The Spanish cultural heritage is most evident in the national language and predominant religion— Roman Catholicism. African cultural elements are most prominent in musical expressions and the carnival vibe of life, testimony to the rich African heritage that existed before and after slavery, but was not allowed to be practiced during it. More recent Antillean and Anglo-American influences also exist. Near the border between Haiti and Dominican Republic, some people practice voodoo. Baseball is by far the most popular sport in the Dominican Republic and there are many famous Dominicans who play Major League Baseball in the U.S., including Albert Pujols, Sammy Sosa, Pedro Martínez, David Ortiz, Jose Reyes, Rafael Furcal, Vladimir Guerrero, Miguel Tejada, and Manny Ramirez. The Dominican Republic also has its own baseball league which runs from October to January. Many MLB players and minor leaguers play in this six-team league during off-season. As such, the Dominican winter league serves as an important "training ground" for the MLB. Eighty-nine percent of Dominicans are baptized in the Roman Catholic Church. Other substantial religious groups are the Evangelical Christians and the Church of Jesus Christ of Latter-Day Saints. 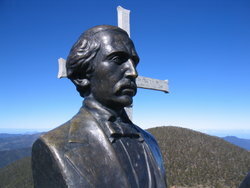 Around one percent of the nation's inhabitants practice pure spiritism, although it is very common for Catholicism and spiritism to be mixed in Santeria's seances and "saint" parties. Every year, tens of thousands of Catholics make the pilgrimage to Higuey to celebrate the Virgin de la Altagracia in late January. The main historical element in Higuey is the cathedral, home of the “virgin de la Altagracia” a painting brought by the Spaniards in the late 15th century. December 25 Christmas Day (Jesus' birthday). The Dominican Republic is known for a form of music called Merengue, which has been popular since the mid- to late- 1900s. Its syncopated beats use Latin percussion, brass instruments, bass and piano or keyboard. What was considered unpopular to the youth, until today, is a form of folk music called Bachata. Bachata is usually slow, romantic, and Spanish guitar-driven. However, bachata's rhythm can be sped up to the same syncopation as Merengue, and it is called bacharengue. Both genres of music are popular throughout the world. Dominican culture is heavily based on music. Some major international exponents include Juan Luis Guerra, Millie Quezada, Sergio Vargas, and Johnny Ventura. In recent years, many young artists have also emerged such as Alih Jey and Carlo Silver. Merengue is a type of lively, joyful music and dance that comes from the Dominican Republic. Merengue means whipped egg whites and sugar in Spanish, similar to the English word meringue. It is unclear as to why this name became the name of the music of the Dominican Republic. This style of music was created by Ñico Lora 1920's however it was promoted by Rafael Trujillo, the president in the 1930s, and became the country’s national music and dance style. World famous Merengue singers include Miriam Cruz & Las Chicas Del Can, Juan Luis Guerra, Wilfrido Vargas, Sergio Vargas, Johnny Ventura, Kinito Mendez, Ravel, Josie Esteban y la Patrulla 15, Pochy y su Cocoband, Fernando Villalona,Cuco Valoy, The Freddie Kenton Orquestra, Elvis Crespo and Conjunto Quisqueya. Other artists popular in the Dominican Republic as of 2006 include Julian, Toño Rosario, Aguakate and Amarfis. Milly Quezada is the Queen of Merengue.